We had an amazing experience with Suzi as our buying agent. As we were living in Sydney at the time, it would have been impossible without her. She took care of all the inspections, we got to see off market properties and she helped us negotiate on our dream house which we got! We could not have done it without her. Some people think having a buyers agent is a luxury - I call it a necessity! We can wholeheartedly recommend Suzi to anyone buying a property in the Southern Highlands. Words are not enough to describe the invaluable help Suzi provided us in finding and securing the property we desired in the Highlands. Originally we sought her out after an internet search to help us with bidding on a Property. After some thought we changed tack and sought another Property which Suzi managed to find before it went on the market. She helped us through all the stages of the purchase including the negotiation and continues to keep in contact to ensure our happiness. Suzi was Fantastic, constantly on the ball, always accessible, and in our case when our dream home seemed to be lost Suzi upped her game and fought hard for us till the end. From the start, Suzi delivered a thoroughly professional and friendly service. Her detailed property appraisals, as well as her insight, guidance and knowledge of the local area were key to finding the right place for our new life in the country. If you are relocating to the Southern Highlands, we strongly recommend you engage Highland Arrivals to ensure your move is as smooth and stress-free as possible. Suzi Bryant from Highland Arrivals was fantastic helping us find and negotiate an EXCELLENT price on our new property in Robertson in July (2017). She was always available and incredibly patient as our brief changed from 4000 squares in Bowral to 5 acres further out! She helped organise a rental for two weeks in the highlands until we could settle on the new place and has continued to give us fabulous advice well after our 'transaction' was complete. I have no hesitation in recommending her. Blessed was the day I found Highland Arrivals on the internet! Suzi sent through highly detailed reports, gave exceptional service, and made our transition into the Southern Highlands from the NT smooth and hassle free. Suzi went above and beyond our expectations and we cannot thank her enough. Discovered Highlands Arrivals online and found Suzi's service helpful, friendly, knowledgeable and efficient. Suzi went out of her way to find out what we were looking for and to provide good advice to us in a flexible, timely fashion. Highly recommend if you need a steer in the Highlands. We have no doubt, that without the friendly, proactive and professional assistance and guidance of Highlands Arrivals, we could not have achieved the very pleasing result that we did, within our required timeframe. 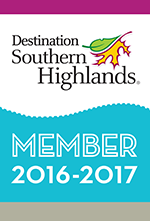 It is without hesitation that we highly recommend Suzi Bryant and Highlands Arrivals.